The 2018/2019 Salomon S/Max 130 Carbon was tested in the men's Frontside category at Silver Mountain Resort by the experts at America's Best Bootfitters, powered by Masterfit. Salomon drops a bomb (the good kind) on the Frontside category with the all new 2019 S/Max 130 Carbon that won our test team over with its properly tight Frontside fit and show-stopping quickness and feel. The connection of foot to liner and liner to shell was seamless and created a deep-trenching connectivity with the ski, testers said. The new Custom Shell HD process takes half the time to mold and our tests yielded the best results ever for the oven-cook-then-wear protocol. One tester said the well-distributed and firm grip on the foot and lower leg foretold of responsive skiing, and he was right about that based on its performance scores. The fit is race-room tight with a particularly snug fit on the lower leg just above the ankles where the boot tapers to wrap the leg shaft and instep area in a highly transmissive match. Testers were initially concerned about the super rigid carbon fiber Coreframe insert affecting the navicular area fit, but no such complaints came to light after testing. As a side note the Coreframe insert area is able to be traditionally heat-stretched for additional room there. Testers who found the overall fit a bit too close for comfort and underwent the new Custom Shell HD molding process came out the other side all smiles and in only 10 minutes—impressed, they were (say that with a Yoda voice). One can tell from the score spread, that the boot's best attribute is its quickness and precision feel underfoot. 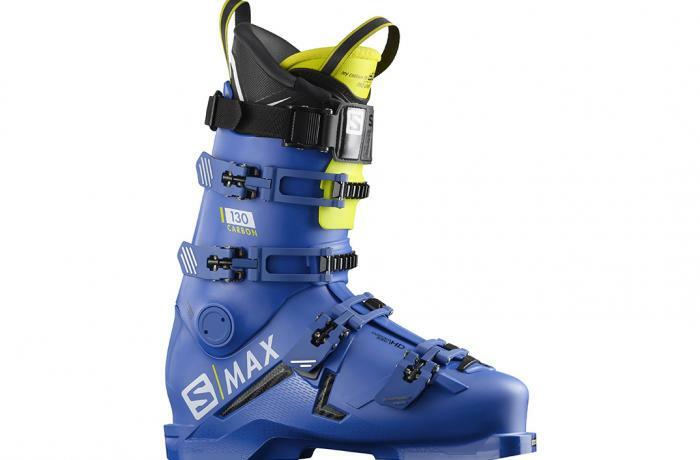 The thin shell wall polyurethane lower boot with the TPEX carbon Coreframe insert puts the foot in close and transmissive contact with the boot and ski and the Grilamid cuff adds snap while shaving weight (only 1664 grams). This construction combination made for a highly tactile feeling boot that responded immediately to foot steering inputs and transitioned turn to turn with synaptic speed, testers agreed. The boot is not lacking in power, whatsoever, testers assured, calling it a trench laying fool and a turn-completing stomper. Regarding post-Custom Shell process performance—we had one of our testers only mold one boot for the sake of comparison with an un-molded boot and he found no appreciable difference in stiffness between the two, afterward. Kaprolene is the additive to polyurethane that allows for Custom Shell molding. New this year in certain models within the S/Max and MTN lines the Kaprolene used is pre-mixed in precise amounts into the polyurethane itself rather than as a somewhat random additive at the time of plastic injection. This creates a more predictable and defined molding response which, when used in the thin shelled S/Max and MTN boots, drastically reduced cook times from ten minutes to only two, molding from five minutes to only three and cool-down to five minutes. Our tests showed legit results without a degradation of performance, post-molding. This year Salomon offers a kit for bootfitters to drill out the Oversized Pivot cuff hinge point and replace it with a lateral cuff adjustment for skiers who need more stance angle adaptability than the Custom Shell process will provide. Cantology cant shims are available for the S/Max boots but require over-plating and routing along standard race room protocols.